This classic Swedish dish gets its name from the story that this was the food that tempted Jansson, a religious fanatic, to renounce his vow to give up earthly pleasures. It perfectly illustrates the thrifty technique of adding a little of something rich and flavourful (in this case, cream and anchovies) to lots of something mild and filling (good old potatoes). A temptation indeed. Preheat the oven to 200°C, gas mark 6. Open the anchovies and drizzle the oil from the tin into a large saucepan on a medium heat. Add the onion and fry for about 5 minutes until softened. Meanwhile, peel the potatoes and cut them into thick matchsticks or very thin chips. Add the potatoes to the onion, cover and sweat for 10 minutes until they start to soften. Take off the heat and stir in the cream. Finely chop the anchovies and mix these in too. Season with black pepper and a little salt. 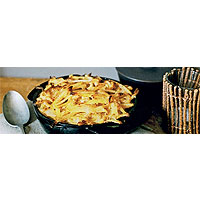 Spread the mixture in a small gratin dish and bake for 25–30 minutes, until crispy. If the potatoes are not tender and the top is browning, cover with a little foil and cook until tender when pierced with a knife.